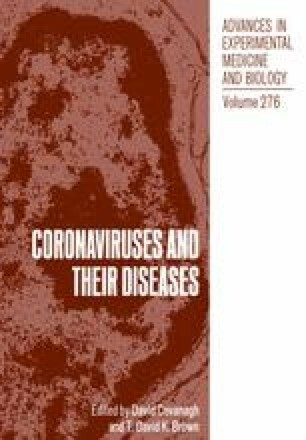 At the Fourth International Symposium on Coronaviruses, July 1989,Cambridge, the Coronavirus Study Group (Vertebrate Virus Subcommittee,International Committee on Taxonomy of Viruses) recommended a simplified nomenclature for Coronavirus proteins, mRNAs and genes. This was considered necessary because of the confusion being caused by the use of different terms,acronyms and numbering system. Some papers in this book already contain the new nomenclature while others do not. We present here the “old” and the “new” systems to aid the reader. The Study Group believed that, because of a lack of information, it was inappropriate to make recommendations regarding nonstructural proteins. For an introduction to the proteins, mRNAs and genes of coronaviruses, the reader is referred to the review by Spaan et al. (1988) and to Background Papers in this volume by Holmes; Rottier; Masters and Sturman and Lai.